When you buy squid or shrimp in the grocery store around here (even at the fish market), it’s usually bagged frozen stuff that the shop has just thawed that day. This is why we usually buy big bags of it ourselves, so we can thaw it out in small quantities as we want it. We never have any lack of ideas for the shrimp, but somehow the squid wasn’t getting used very quickly. I spent some time hunting out recipes for pre-cut rings and tentacles, especially Chinese, which I thought would be particularly well-suited. I found surprisingly few Chinese recipes for squid, but lots for clams, and it occurred to me that if clams in black bean sauce was such a fixture, why not squid in black bean sauce? Why not on noodles? And a dinner concept was born. So far I’ve been making it up as I go along each time, but maybe at some point I’ll settle on a particular recipe – or maybe not. I tend to cook by the “spoonful of this, spoonful of that” method in any case. 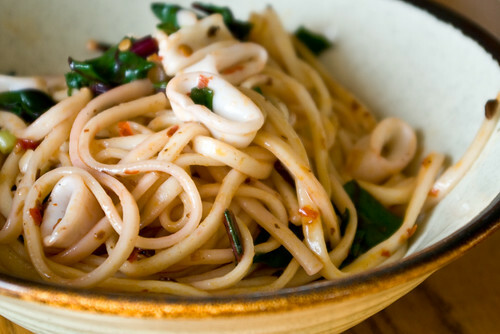 If you have squid in the house, and you can remember to thaw it in time, this is a fantastic, blazingly-fast weeknight dinner – certainly no more than half an hour from start to finish, if you prep while the noodles are cooking. And you could use considerably less chile than I do, if you don’t happen to like having your sinuses cleared by your dinner. But what I really love is the contrast of texture between the squid and the noodles, and the saltiness of the black beans. Everything else is flexible. The way I’m doing this at the moment (subject to change as I experiment, but this is way tasty): first I cook and drain the noodles – we’re really liking udon with this, but any kind of slithery noodle would work – and toss them in a large bowl with some of the sludge from our homemade hot chile oil and a splash of soy sauce. Then I get all my condiments, squid and vegetables ready to go, as none of this takes any time at all to cook. I heat peanut oil in the wok, and toss in chopped garlic and scallions. As those sizzle, I add a spoonful of chile-garlic sauce and a spoonful of fermented black beans. Then I add the squid and start stir-frying briskly, adding a splash of rice wine. As soon as the squid turns opaque (perhaps a minute), I turn it out into the bowl of noodles. Then I put the wok back over the heat and toss in a bunch of chopped greens, like bok choi or beet greens, and stirfry with a bit of soy sauce until wilted, then scrape those into the noodles as well. Serve hot. Slurp. 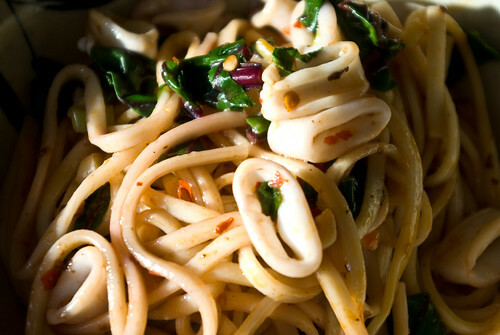 As much as I love it with the udon, I would also really like to try it with rice noodles. I’m thinking the flat, 1/8″ wide kind.